Trust the doctor. Thank you for the support of family. CARGULLO JEAN BUENA is a teacher from the Philippines. She loves her job and is passionate in her dream of sharing knowledge to the youth, the hope of the country. She was going on with her daily routine when in 2008, she found out that there was a thumb-sized lump in her right breast. During that time, she did not feel any discomfort so she did not seek any medical treatment. Until in 2012, when she underwent a regular check-up and found that the lump grew as large as a fist. After taking biopsy in 2013, she was diagnosed with breast cancer. The news surprised JEAN because she did not experience any symptoms or pain. The local doctor advised her to undergo surgery to remove the whole breast but she wanted to save her breast so she refused. Thus, her husband looked for other treatment options for JEAN. JEAN learned that in minimally invasive treatment, there is no need for open surgery but it still yields the same effect so she decided to give it a try. In May 2013, she took the first treatment at Modern Cancer Hospital Guangzhou. The multi-disciplinary team of doctors diagnosed her as soon as possible and the result showed that it was already stage 4, with metastasis of the lymph and of the left breast. Hearing the result made JEAN more worried. With the encouragement of her husband, she underwent the first interventional therapy. Interventional therapy is done under the guidance of medical imaging equipment wherein the anti-cancer drugs are injected directly to the blood supplying artery of the tumor which effectively shrinks the tumor. Compared with the traditional chemotherapy, interventional therapy targets the tumor precisely and brings lesser side effects to the body; the drug concentration of anticancer drug inside the tumor is much higher than the conventional chemotherapy because it is directly infused into the tumor and so it brings better efficacy. After two sessions of interventional therapy, the tumor had shrunk. Then JEAN took one session of cryotherapy. Cryotherapy is done by releasing Argon gas to lower the temperature and freeze the tumor and the surrounding tissue; then the He gas is released to thaw the frozen tumor thus destroying it in the process. 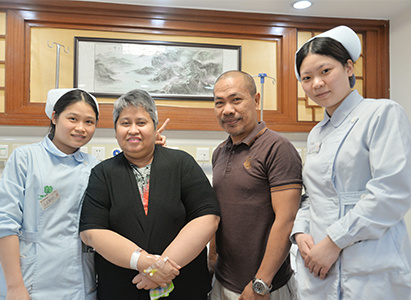 After 6 sessions of interventional therapy, one session of cryotherapy and consolidated radiotherapy, the tumor cells in JEAN BUENA CARGULLO’s body have been destroyed and her condition is currently stable and she now returns to work. Two years has passed, JEAN still comes back for regular check-up every year. The attending doctor of JEAN, told us that JEAN is in a good and stable condition and so far there is not a sign of cancer recurrence.